The miniature pinscher is a toy dog breed that was originally bred rid homes and businesses of mice and vermin. 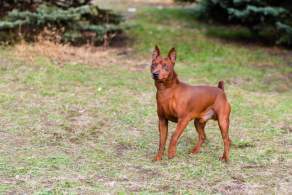 Many people think the miniature pinscher is a smaller version of the doberman dog breed, but they are two separate dog breeds. The breed is often called the "King of Toys" due to their behavior, character, and mannerisms. Mini pinschers have a strong pack leader mentality and if you don't fit that role, they will fill it for you. This can make the breed a bit challenging for inexperienced dog owners. 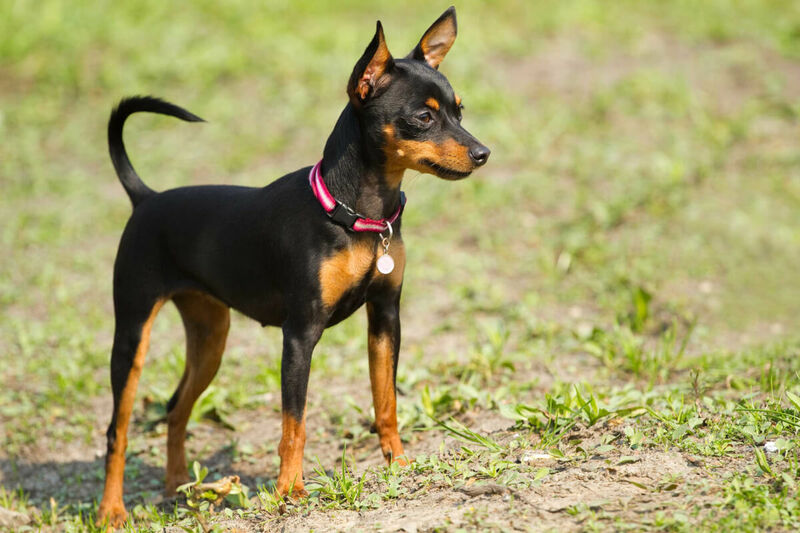 Unlike other toy dog breeds, the mini pinscher is sturdy and can tolerate rougher play without injury than similar sized dogs. Below are the details and characteristics of the miniature pinscher. Miniature pinschers resemble many dogs, but they are most commonly mistaken to be a miniature version of the doberman. The mini pinscher definitely has a big dog in a small dog's body mentality. The breed is known for their "I'm in charge" personality, which is entertaining considering the breed weighs 8-11 pounds and is 10-12 inches tall (from ground the shoulder). 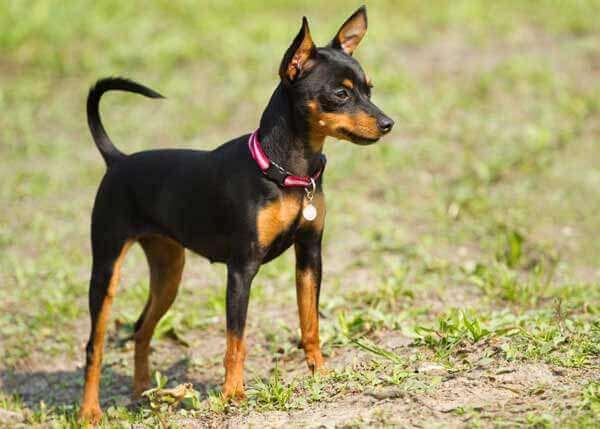 The miniature pinscher was originally intended to be the ideal indoor dog for getting rid of vermin, and this can still be seen in the breed today as mini pins are alert, full of energy, and very investigative of noises and perplexing events. The breed is intelligent and is an excellent watch dog. It is important to associate yourself as the alpha dog since the miniature pinscher needs a strong leader to follow. Failure to do this can result in difficulty getting control over the dog. The breed does best with other kids as they don't tolerate rough handling too well. The miniature pinscher has a very low maintenance coat. Their short hair stays clean very easily and only requires brushing a few times per week to keep the coat shiny. Miniature pinschers have an overabundance of energy. It is recommended to give them daily exercise to keep them well exercised. Those who believe the Miniature Pinscher (Min Pin) origin began with the Doberman would be incorrect. 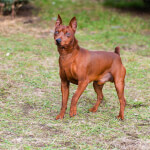 This breed dates back several centuries--well before the Doberman Pinscher was created in the 1800s--to Old Germany. Though its exact lineage is unclear, the Min Pin is believed to have been developed from a diverse variety of breeds including the Dachshund, the Italian Greyhound, the Manchester Terrier, and the German Pinscher, among others. First bred to hunt vermin, the Min Pin was originally called the Reh Terrier because of its similar appearance to reh, which were small deer that populated Germany's forests; eventually it became known as the Zwergpinscher (with zwerg meaning "dwarf" or "little"). As the decades passed, the Min Pin's popularity grew in Germany and in Scandinavian countries--but the history of Miniature Pinscher dogs as a modern breed really flourished in 1895, when a group of German breeders formed the Pinscher Klub; soon afterward club members wrote the first breed standard, and within a decade these dogs began appearing in shows across Germany. The Min Pin's prominence increased around Europe in the early twentieth century, and after World War I the breed began being imported to the United States. 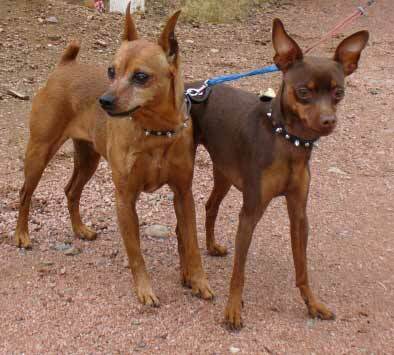 Breeders and enthusiasts created the Miniature Pinscher Club of America in 1929, and that same year the American Kennel Club admitted the breed into its Terrier group. (The breed was shuffled to the Toy group in 1930.) 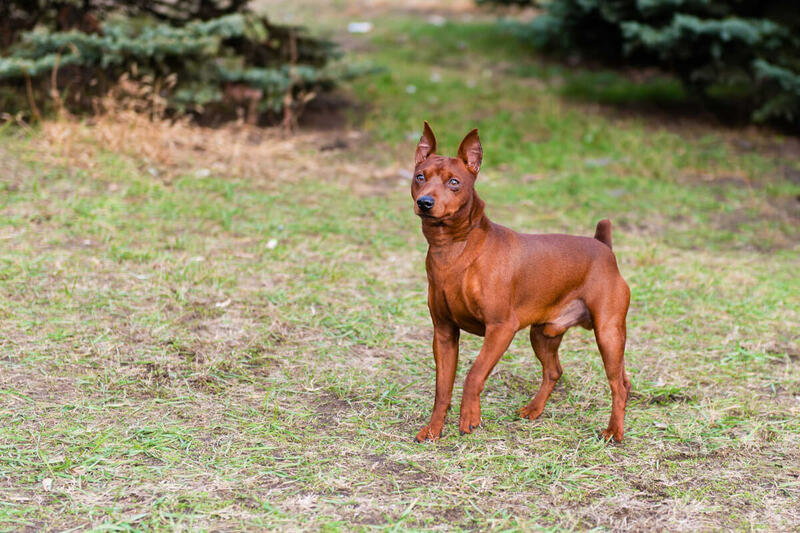 The AKC referred to the breed as the "Pinscher (Toy)" until 1972, when the club renamed it the Miniature Pinscher. Today the Miniature Pinscher ranks 68th out of 193 AKC-recognized breeds. And though its vermin-hunting skills are still undoubtedly first rate, the Min Pin--now dubbed the King of Toys-- is cherished around the world as an active, bold family companion. 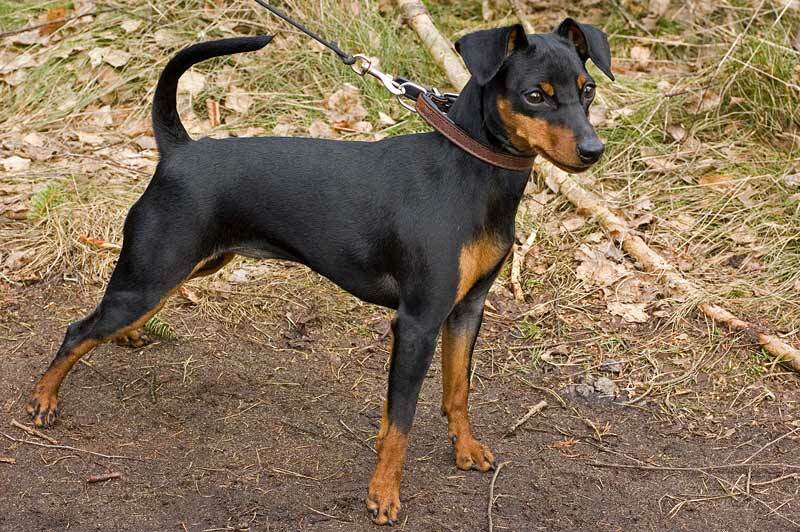 It's logical for people to mistake this breed for a miniature Doberman--because in reality these dogs look just like the Doberman Pinscher, only at about one quarter of the size. 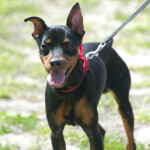 And just like the Dobie, the Min Pin is streamlined, athletic, muscular, and built for speed. And specifically what does a Miniature Pinscher look like? Some individual features: the body is normally a bit greater in length than in height. The small head is wedge-shaped, with a fairly long muzzle and round eyes in various shades of brown. 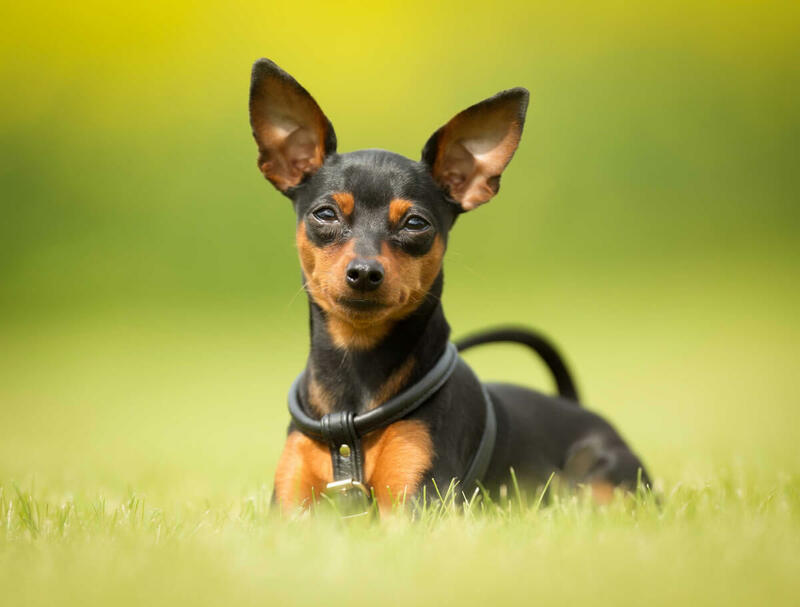 Regarding ears: the Miniature Pinscher with uncropped ears has triangular, medium-sized ears that either hang slightly or stand erect--but some owners have Min Pin ears cropped during the puppy's first year. Depending on the style, the Min Pin ear crop can be very short (one inch or less) or long (in which almost the entire ear flap is left intact). As with all breeds, Min Pin ear cropping often includes bandaging the ears with some type of splint to make them stand erect. The Min Pin's chest is quite broad for a toy-sized breed, and the legs are long and straight. 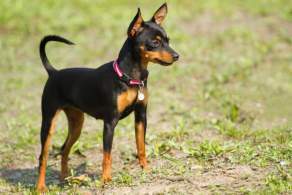 In its natural state, the Miniature Pinscher tail is medium-length, saber-shaped, and standing erect or curved over the back--but many owners have the tails docked within a few days of a puppy's birth. 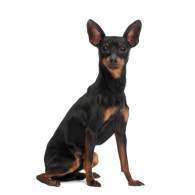 The Miniature Pinscher coat is short and smooth, and comes in black and various shades of brown. 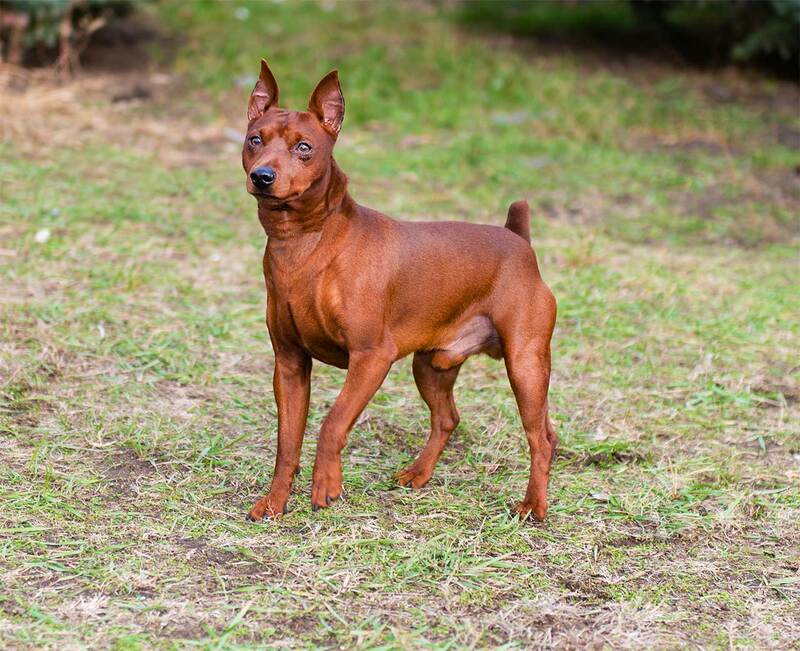 Below are common coat colors of the miniature pinscher dog breed. 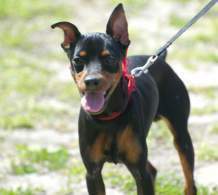 Miniature Pinscher size: this breed is in the Toy category. 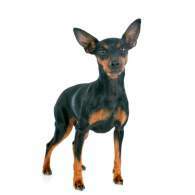 Miniature Pinscher height is 10-12½ inches at the shoulders; Miniature Pinscher weight is 8-10 pounds. Though dishonest breeders may offer different Miniature Pinscher "breeds" for sale that vary a good bit in size and coat length, the AKC and other official clubs explicitly state that are not multiple Min Pin breeds, or even variations within it. In regards to specific features like head size, leg length, etc., slight variations do exist with individual dogs, but these are naturally occurring and do not indicate a distinct sub-type. 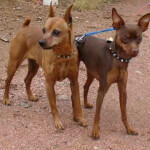 Any Miniature Pinschers that are markedly different from the breed standard are almost certainly crossbreeds, likely with the Dachshund or Chihuahua, among others. New or potential owners who are unsure of a Min Pin's lineage can have the dog genetically tested to be sure. As to size, the Min Pin is consistent: 10-12½ inches in height and 8-10 pounds in weight. Crafty breeders advertise their "Big Miniature Pinscher" dogs, or "Micro Mini Pinscher Puppies" very small in size--but again, these are likely crossbreeds. This breed's coat--short, hard, and smooth--sees no variation either. 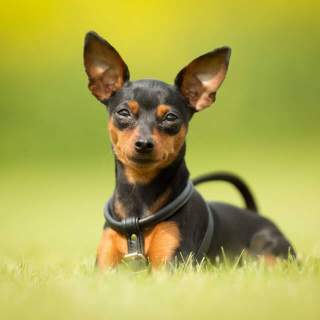 To make a quick buck, breeders will selectively crossbreed Min Pins with long-haired toy breeds like the Long-Haired Chihuahua or various terriers--then proclaim their sale of "Long-Haired Mini Pinscher" dogs. The Miniature Pinscher temperament: clever, playful, curious, and confident. This breed is almost the cliche' of "large dog in a small dog's body"! These dogs are assertive and bold, and will definitely need owners willing to show them they do not rule the roost. Despite these dominant Min Pin traits, these dogs are normally very affectionate and enthusiastic, too. And though not known for being super-intelligent, the Mini Pin temperament lends itself to fairly easy training--but the teaching must begin when the dog is young, and the trainer will need to use firm, consistent methods. Crate training is highly recommended for puppies of this breed. One of the most beneficial Min Pin characteristics: the breed's watchdog skills. These dogs are fearless and protective, and combined with their endless curiosity, that courage makes a Min Pin a fantastic lookout! The typical Min Pin will sound a loud vocal alarm if it perceives any potential threat--which, unfortunately, could simply be falling leaves. The good news is that owners will be notified of any true threats well in advance. Potential owners ask: "Are Miniature Pinschers good with kids?" For the most part, they are--especially if the dogs and the children are raised alongside one another. Kids will need to treat Min Pins with kindness and respect; if they grab, pinch, or treat the dog roughly, a Min Pin and its bold personality will in turn develop a dislike for any children. Because of this "alpha" Miniature Pinscher temperament, children 10 years and older mix better with the breed. Overall, the Min Pin will get along okay with other pets--but since the breed was developed to hunt vermin, rodents are a huge exception. Min Pins mix fairly well with other dogs, especially if they're raised together; just expect some "alpha" behavior as your Min Pin instinctively tries to establish its dominance. A Min Pin and cats is a decent mix--but because of the breed's prey drive, it may naturally chase a kitty (but usually won't be aggressive). Min Pin owners with rodents, though, should beware. 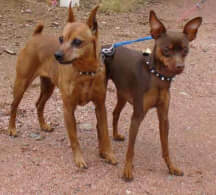 These dogs' instincts are to kill small, furry animals, so any hamsters or gerbils in a Min Pin's household are in danger. Below are pictures of the Miniature Pinscher dog breed. 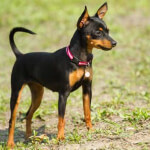 Those thinking about owning a Miniature Pinscher will need to consider these dogs' temperaments before bringing one home. Though they're not very "yappy" or destructive, they will desire--actually, demand!--a lot of attention, and will become constant headaches if they don't get it. And once home, Min Pins will definitely try to rule the roost unless they're taught firm, consistent discipline. Owners will definitely need to teach their Min Pins that humans, not the dogs, are the bosses. This breed should also be allowed to live inside with its human family members. Not only will Min Pins be thoroughly unhappy if forced to live in the yard, but they're incredible escape artists, and will jump over, dig under, climb, or even wriggle through a fence if given a chance--so owners must provide constant supervision when these dogs are outside. Their short coats and small size also mean they get cold easily, so they don't do well in cooler climates. Speaking of coats: "Are Miniature Pinschers hypoallergenic?" is a frequent question. In short, they're not. Though these dogs' short coats don't shed too much (and are easy to groom), the shedding is enough to trigger allergic reactions in some people--so this isn't the best breed for allergy sufferers. All breeders with 'Quality Breeder' recognition have met our Quality Breeder Requirements. * Please note - we are not endorsed or affiliated with any of the breeders listed above. However, we do our best to only list reputable and established breeders.